Rocky Mountain Bighorn Sheep; photo © James Ownby / My View of Nature (used by permission). Named for their massive, curling horns (which can grow to 50 inches in length) and known for their agility and perfect balance, Rocky Mountain bighorns (Ovis canadensis) are found only in the Rockies (usually above the timberline) in extremely rugged terrain. Their horns are not shed annually like the antlers of deer and elk, but grow in length and circumference throughout the sheep's life (a pair can weigh nearly 30 pounds). Fewer than 45,000 bighorn sheep are scattered through the western United States and Canada in small, isolated herds. 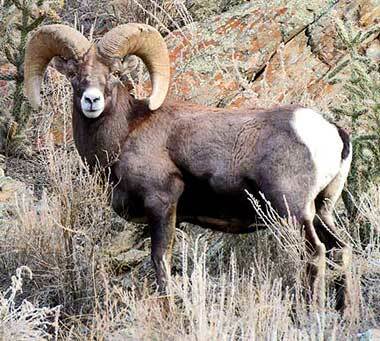 Rocky Mountain bighorn sheep protection status on Endangered Species Act: Endangered. Uncontrolled hunting caused the extinction of the bighorn subspecies that once lived in the Black Hills and Badlands of South Dakota (the three small herds that exist there now were transplanted from other states). Today it is illegal to pursue, take, hunt, wound, or kill the Rocky Mountain Bighorn Sheep except as provided by law. Rocky Mountain bighorn sheep are very social animals, generally separated into two groups. Mature rams stay in one group while the ewes, lambs, and young rams congregate separately (rams stay with the "nursery group" until 2- 3 years of age). The groups join during the rut (mid November through late December) and sometimes for a short period in the spring. Ram bands have a social hierarchy established by body and horn size. Dramatic head- butting occurs between mature rams to determine leadership and dominance, but once the hierarchy is established, rams live in the same group with little further conflict (normal life span is 10 to 12 years).